"Mr. Jeepney: King of the Road"
This is the unusual story of what is certainly one of very few original Philippine Jeepneys in North America. Mr. Ben Wallace of Dallas, Texas originally brought it to America. The Icon Group purchased "The Flying Water Buffalo" from Mr. Wallace. The Icon Group is a noted recruiter of foreign medical professionals. It acquired the Jeepney for use when Icon exhibits at Human Resource and Hospital Conferences. The Jeepney's purpose is to draw crowds of potential clients at these events, and draw the crowds it certainly does! 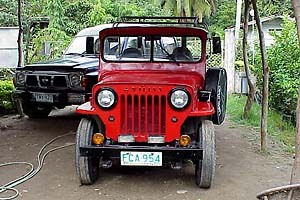 The seller, Mr. Wallace had a Texas title representing the Jeepney to be a 1972 model. But one look at the vehicle and you knew that was wrong. The model looked like a CJ-3B, not a later version from the 1970's. 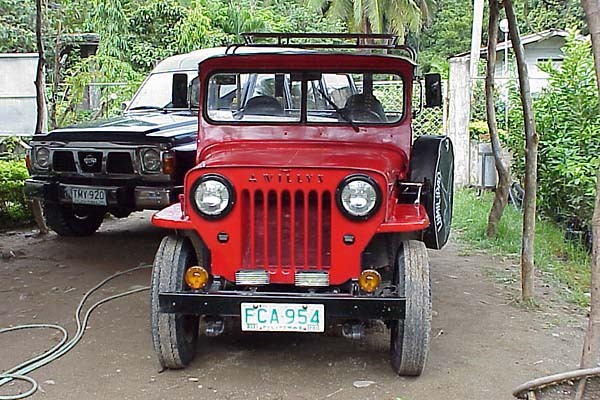 The Jeepney is a Willys Jeep manufactured under license by Mitsubishi Heavy Industries in Japan. The Jeepney actually has Willys on one side of the engine hood and Mitsubishi on the other! After tons of research, torch work and scraping the frame behind the front left tire, the serial number for the chassis was discovered. That number is 59CJBM17571. The State of Washington inspected it and determined that it was a 1954, not a 1972, and so titled it as a classic vehicle. Icon has sponsored an extensive rebuilding of the vehicle. It is a great attention-getter as a corporate promotional tool. It was pretty much of a basket case when Icon acquired it. The neglected treasure required a total restoration. About everything needed replacing or rebuilding -- lights, tires, rims, engine, front bumper, both transmissions, paint, every seal and gasket in the engine, transmissions, differentials, wheels, brakes, fuel pump, carburetor, wiring, radiator, all shocks (all were broken or worn out), exhaust system, battery and on and on. But strangely, no rust! The underside was given a good acid bath. After the condition of the underside was confirmed, the vehicle was promptly re-under coated. What saved its body from rust these 51-years was that the original undercoat job that was about two layers thick! A noted Jeepney sign maker in Manila by the name of "Wacky" made the polished aluminum signs. The signs were brought home as excess baggage on a flight from Manila to San Francisco and then on from SFO to Seattle, after recruiting Filipino nurses. The vehicle is complete with 3 winged horses on the hood, because it is believed that if you do not have horses on the hood, you will have no horsepower under the hood. It now is complete with a real Jeepney horn that produces sounds of a Carabau (A water buffalo), a Rooster, a Barking Dog and a Cat! The Jeepney has its own enclosed 28-foot auto-transporter, that is fully equipped with a winch, tools, spares, battery charging system etc., to take it to events in the Western United States. 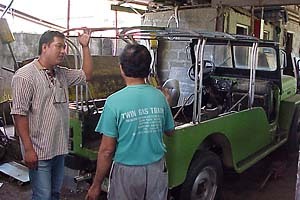 "Mr. Jeepney" is scheduled to exhibit and please the crowds at 8 events in 2005. Prospective employer clients flock to it to get their pictures taken with one of the very few "real deal" Jeepneys in America. Origins as "The Flying Water Buffalo"
Seen in this photo under construction in the Philippines, the jeepney was purchased there by Ben Wallace in 1999, and the following is Ben's description of how he managed to bring his very own jeepney back to Texas. "For years I have been fascinated with the success Filipinos have had in converting the many World War II jeeps left in the Philippines into vehicles of public transportation which they call jeepneys. 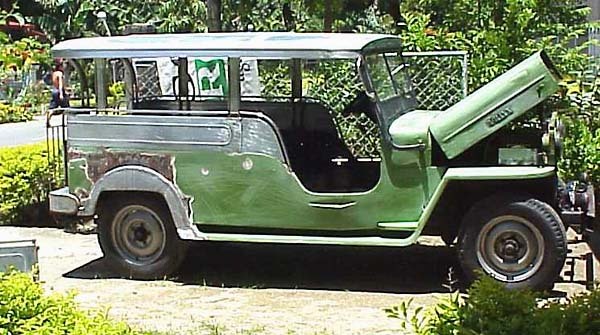 The original jeepneys were military jeeps that were stretched about a foot. A solid roof was placed on top, a door was put in the rear, and the spare tire was placed on the driver's side. Many forms of color and decorations were placed on the jeepneys until they evolved into a unique form of Philippine folk art. "The early jeepneys were converted to hold six passengers in the back -- three on each side. In the late 1960s, I was riding on such a jeepney that was packed with 22 passengers plus two goats, four chickens, and bags of rice. 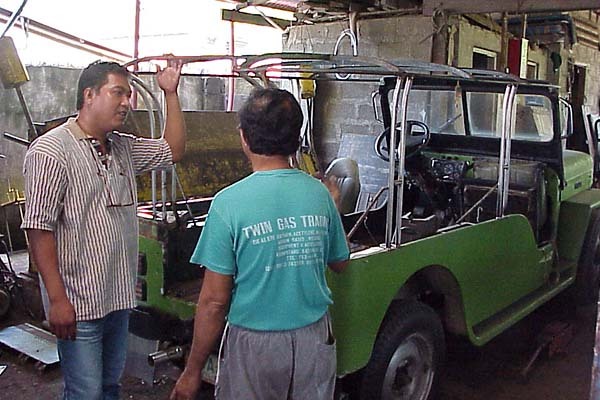 Today, small and large jeepneys (up to at least 14 passengers in the back) are manufactured in the Philippines. I should add, however, it is my understanding that these modern Philippine jeepneys cannot be imported into the US. 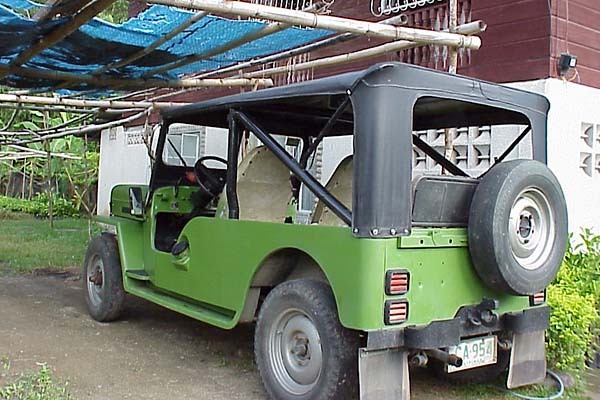 "I purchased the Jeep in the pictures during June of 1999 in the province of Batangas, which is south of Manila. It appears to be a CJ-3B manufactured in Japan by Mitsubishi (editor's note: model J32). It still had the original four-cylinder engine in it but it had to be rebuilt. It had an old modified Chevy starter. The standard four-wheel gears worked but it needed a new clutch. "Since I had long wanted a Philippine jeepney, I took my Jeep to a mechanic and a body man in the Philippines (where labor is inexpensive) and told them to make me a jeepney. The new sides and top are made from sheet metal. The underlining of the roof is made from Formica. Because of the engine and wind noise, they had to put eight speakers in the Jeepney -- two in front, four in back, and two between the Formica lining and the roof. "I couldn't bring myself to let them put a horse statue and large horns on the hood (although I might still do that), or paint it many colors. I had a jeepney in the Philippines many years ago with "I Love You Because" written across the front. 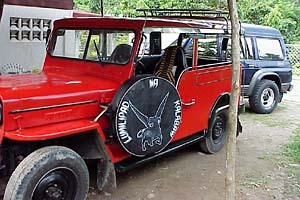 "Lumilipad na Kalabaw" (on the spare tire cover) is Tagalog for "The Flying Water Buffalo". For more on jeepneys, see Jeepneys of the Philippines and a Sarao Jeepney for the USA in Spokane, Washington. Also on CJ3B.info, see Importing Jeeps Into North America.